Get ready to kick back and relax for a week (Sat-Sat)! 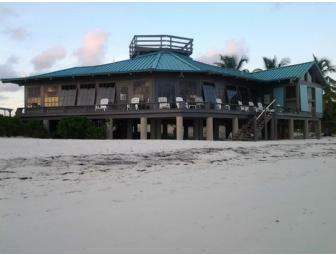 Bone Ami is a spacious private beach home with 3 bedrooms and baths and accommodates eight people. It also has a guide (guest)house which sleeps 3 and has its own own bathroom. 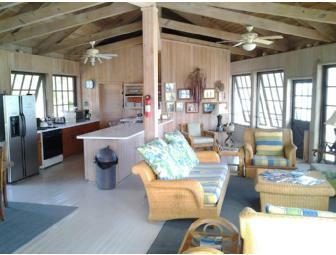 The retreat is only 40 feet from the clear blue waters of Cherokee Sound on a beach that seldom sees more than a dozen people a day. The beach is part of a flat which bonefish come across as low tide progresses. 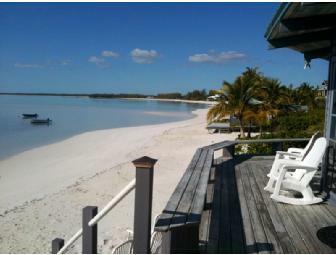 It is the perfect spot for a family to enjoy snorkeling, diving, kayaking or just relaxing. The Island Explorations crew would be happy to arrange Bonefishing Guides, Deep Sea Fishing guides for Dauphin, Wahoo, Tuna and more. A local cook can also be hired. Bone Ami is available from November 1st, 2012 to October 31, 2015. This donation is good for eight people or a family of up to twelve including kids. Travel is not included. For more information go to www.islandexplorations.com. Your support matters, so The Friends of Bitsy Grant Tennis would like to use your information to keep in touch about things that may matter to you. If you choose to hear from The Friends of Bitsy Grant Tennis, we may contact you in the future about our ongoing efforts. Copyright © 2003-2019 The Friends of Bitsy Grant Tennis and BiddingForGood, Inc. All Rights Reserved. Designated trademarks and brands are the property of their respective owners.